Home › Home and Kitchen › Krups F203 Electric Spice And Coffee Grinder With Stainless Steel Blades 3-Ou..
Krups F203 Electric Spice And Coffee Grinder With Stainless Steel Blades 3-Ou.. Manufacturer: Krups North America Inc.
Why Is Fresh Ground Coffee so Important? There is nothing like a hot cup of coffee in the morning. Every professionalbarista will tell you that preparing a cup of coffee or espresso is a real artand a precise science. It can take years to perfect every step of the process.And this process begins with freshly ground beans. In fact, coffee beans loses40% of their aroma in the minutes following the grinding process. In otherwords, the best cup of coffee or espresso anyone can get comes from freshlyground beans. Because KRUPS mission is to provide the perfect in-cup result,we have developed the KRUPS 203 grinder to enable each and every coffee loverto get the same professional results from a coffee shop. .. at home. Prepare a fresh cup of coffee every day with freshly ground coffee withoutlosing any coffee flavor. View larger Chop nuts to enhance your salads or to create great homemade cookies, View larger Chop herbs and spices for a fresh addition to your gourmet meals. View larger Sharp Stainless Steel blade will grind or chop with precision. View larger Large capacity so you can prepare up to 12 cups of coffee. View larger From coarse to fine, customize your grind in seconds for your coffee orespresso-based drinks. 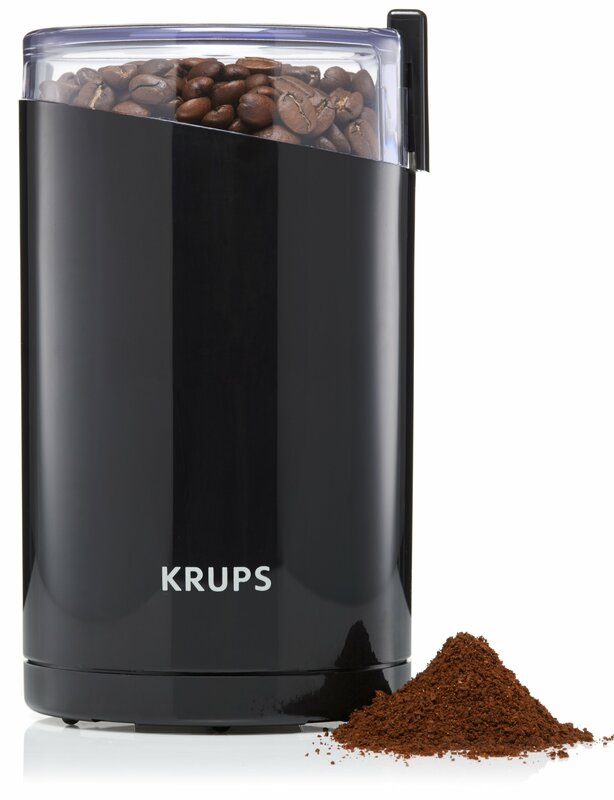 View larger Compact, modern and convenient the KRUPS coffee grinder will allow for an easygrinding in few seconds : from a coarse "turkish coffee" grind size to a fineespresso grind, enjoy as many drinks as your household would like at the touchof a button. Versatile, the KRUPS 203 grinder will also allow to chop spices,nuts or crackers to enhance summer salads or gourmet desserts. About KRUPS Bold design, precision, ingenuity and unwavering craftsmanship uniquely definethe philosophy of the leading brand Robert KRUPS created in 1846. Startingwith the most precise scales in the world, Robert KRUPS diversified the brandportfolio launching historical products such as the first electrical coffeegrinder, the 3-Mix hand mixer or the Onco Coffee Maker. Soon identified as onekey player in the coffee and espresso industry, KRUPS has continued growing,exporting the German high quality products across the globe. Today, KRUPSperpetuates the high standards of quality that have been set more than 150years ago and put Passion, Precision and Perfection at the heart of each andevery product.